Every great meal, like any good book, TV show or movie, should have an intriguing beginning, a fruitful middle and a satisfying conclusion. Recurring food-related events such as Chef à l’érable should be treated in the same fashion. When Laurent Godbout started Chef a l’erable 4 years ago it was a massive success. Reinventing the sugar shack experience by remixing it in surprising ways was not only innovative, it helped revive local interest in one of Quebec’s most cherished traditions. The beginning was innovative, the years in between built on that but after having experienced the fourth edition I believe it’s time to move on. Chef a l’erable kicks off every year with a massive brunch that gathers media and VIP guests at La Scena in Old Montreal. It’s usually the first edition of the season which is a pretty good indicator of how the following weeks will unfold. The brunch is a family affair with kids running around getting high on maple syrup and sugar while the adults enjoy themselves while eating the food that has been prepared (and later get high on maple syrup and sugar). The brunch is no easy feat for the staff that have outdone themselves in the past. This year they shook up the formula by having the media event at night. It was a surprising turn of events but knowing how great Chef a l’erable has been in the past it didn’t make a difference if it was a brunch or a dinner. It wasn’t until we began arriving that we noticed something was off. After mingling aimlessly for an hour we took to our seats for dinner. The meal, as usual, was shared between four of us (which is how it’s served normally – minimum 4 person reservation) and it started with a selection of soy and maple syrup beef jerky, shrimp rice cakes, fried kale and a peanut hummus. The squash hummus with peanuts and shrimp rice cakes were good but the fried kale was less so. I can’t quite describe the flavour but it tasted like the kale wasn’t fresh when it was dried. The maple beef jerky was exactly as you might expect. 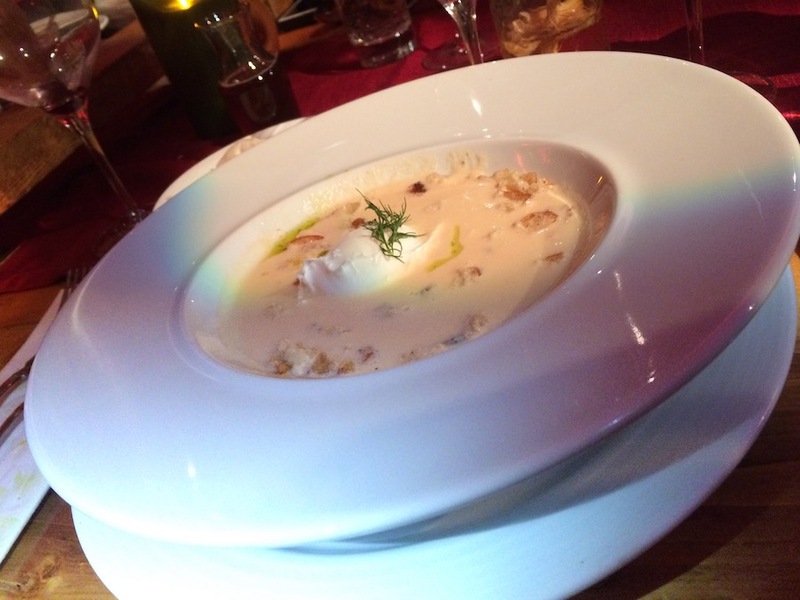 The second service was a bowl of salmon soup with a poached egg. It tasted fine but it was served tepid. The soup wasn’t hot enough and the poached egg was, well, as you would expect a poached egg to be. So far the innovation that we’ve come to expect every year was absent. The final straw for me was the tower of fried glazed chicken drumsticks and confit duck wings that came out of the kitchen. Accompanied by three sauces, potatoes and cold turkey-ricotta meatballs, the chicken wasn’t warm and the duck was dry. It’s as if each of the plates has been sitting out for 15-20 minutes before being served. You might say, well, the kitchen is serving hundreds of people, you can’t expect it to be that warm. Well, last year and the year before we didn’t have an issue with warmth. The food was bland and uninspired. At $65 ($25 for kids) a pop with a minimum of 4 people reserving, I expect better. The rest of the meal consists of a giant vol-au-vent, maple and pomegranate glazed carrots with Dijon, beans and a dessert that was all followed by the traditional taffy on snow (here iced milk). The dessert, a raspberry-lemon meringue yule log with glazed donuts, featured little cookies that looked store bought. As I left the dinner I couldn’t help but wonder what’s the magic number is for special events like this before they start feeling stale, repetitive or in this case uninspired. Maybe it’s that we’ve come to expect so much from events like this that it is tougher to keep topping what was already so wonderfully executed in past editions. Taking a break from Chef à l’érable this year might be in your best interests. In any case there’s no shortage of maple or Sugar Shacks in Montreal this time of year.